This comic made me laugh and shake my head in recognition. 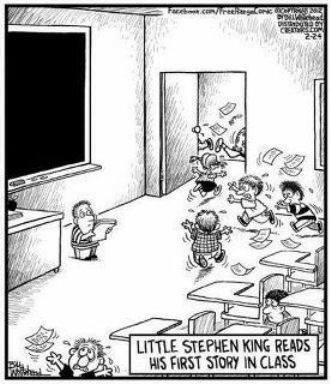 To be clear, I am not at all suggesting that I belong in the same sentence as Stephen King, the master, but I can identify with the perils of writing “scary” stories. In my experience, it’s not the kids fleeing the room. I know for a fact that, generally speaking, there’s a huge readership out there for scary tales. I’ve stood before too many groups of excited students, from California to Michigan, Texas to New Jersey, Virginia to Connecticut (just this year) to have any doubts about the appeal of those stories. The big obstacle is the gatekeepers, the teachers and parents, people worried about what a scary story might do to a young reader — or, even worse, the worry about the potential backlash, the complaining parent. That’s the worst form of censorship in today’s world, I think, how the fear of parental complaint prevents some books from entering classrooms. In the meantime, today I finished writing the first draft of Scary Tales #6: Swamp Monster. It was fun for me to invent new characters — twin brothers and a lively neighbor, Rosalee Serena Ruiz — and set that story near a polluted swamp somewhere in East Texas. New stuff for me, new challenges. I can’t wait to see what the illustrator, Iacopo Bruno, does with this one.